Getting Ready for the Holigays! It's the middle of November and I am now contractually obligated as a small business owner to talk about the holidays. This time of year is a pressure cooker of emotions inside a frenzy of motion wrapped underneath a pretty paper wrapping and bow. Memories, both pleasant and decidedly not, flood us wave after wave in unrelenting fashion until we've turned the corner to January. And this is for all of us. Not just those of us in the LGBTQIA2+ community. Our wedding announcement in December 2015. For me, since marriage, holidays have meant something different. Throughout my 20s and most of my 30s, I'd spent holidays with my aunt or my family of choice (friends who I'd adopted, you see). I'd throw a big meal around Thanksgiving (before "Friendsgiving" as a term had legs) and I'd crash someone's home for Christmas. But now I have in-laws and my idea of family has grown. I have a mother-in-law who loves to bake, a father-in-law who can make nearly anything by his hands, sisters-in-law who have brought me into the fold more quickly than I ever expected (to the point where I often can't keep up! ), a delightfully charming 9-year-old nephew, and a beautiful bouncing baby niece who will be 6 months old on my and Cheri's second anniversary. I love each of them. But our queerness has been the rainbow elephant in the room during our family get togethers. I didn't have to deal with that in my 20s and 30s because I didn't have holidays with my own parents, having never known my father and having no relationship with my mother after my grandparents passed away. The very definition of privilege. I never had shouting matches or conflict or violence or eviction from my family over my sexuality or gender identity. My wife's parents lean hard conservative in their social views, but I honestly believe they love me as an individual. That doesn't necessarily translate to a love of having me as a daughter-in-law by way of being married to their lesbian daughter, however. But, I'm still sheltered by my own privilege in that this is not something that I have to battle directly as a) it is Cheri's parents who have to come to their own reckoning and b) I've aged into adulthood and independence and have no threat of economic or emotional relationships being withdrawn or turning toxic. In a week, though, we are northbound for Wisconsin for Thanksgiving and we are set for the holigays to commence, in their full tension-filled and passive-aggressive glory! It's always warm and welcoming at Queer Chocolatier! Queer Chocolatier Celebrates YOU during the Holigays! I know that many other folx have more challenging times during this part of the year and I want to let you know that I am here for you. I am here for the moments that memories overwhelm or nerves take hold. I am here for the times you feel you have to steel yourself for going back into battle over dinner trimmings. I am here for you when you don't feel validated in who you are or who you love by the people who you were surrounded by during your early years. Queer Chocolatier sells crafted chocolate truffles, yes. But we also stand in solidarity with those who need neighbors and friends and family but may be lacking during the moments we are most vulnerable. If you need a moment to chat, near or far, send me a message or visit our shop. The only darkness I want you to experience during these last couple of months of 2017 is the darkness of my chocolate confections. If you aren't queer and/or trans* (or even if you are), and you know someone who is and has a rough time during the holidays, let them know you love them. Reach out to those around you who may not have a great experience with going home to visit family or doesn't go home at all because of what has happened in the past. This is the time of year that allies can actually do allyship work and not simply label themselves as allies. If you misgender your friend, work through it to do better but don't turn the attention back to yourself on how hard it is to remember pronouns or names. Stand up when someone deadnames a friend or relative. Let that person know that such an act is harmful and violent. Never, under any circumstances, out someone in front of others, including the family or friends of that individual. Your friend may trust you with that knowledge but may not be in a place in their life to be out fully and that is okay. Let me help you in showing your friendship and love by providing gifts that can affirm or comfort those you adore. Consider a piece of art from our line of Homo Decor for their home or any one of our selection of truffles, in Classic or Vegan. Let's all do a better job of taking care of each other during the holigays! 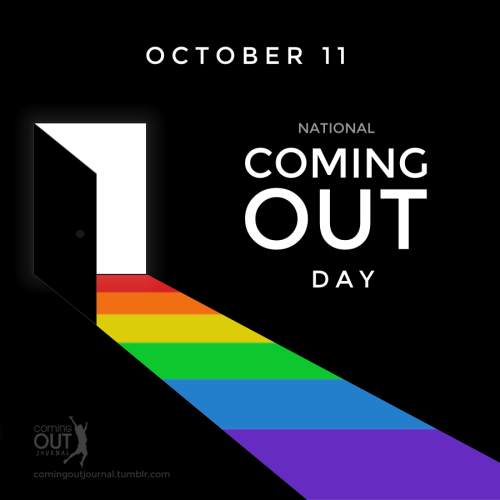 October 11 is National Coming Out Day: What Does That Even Mean? What does National Coming Out Day mean? 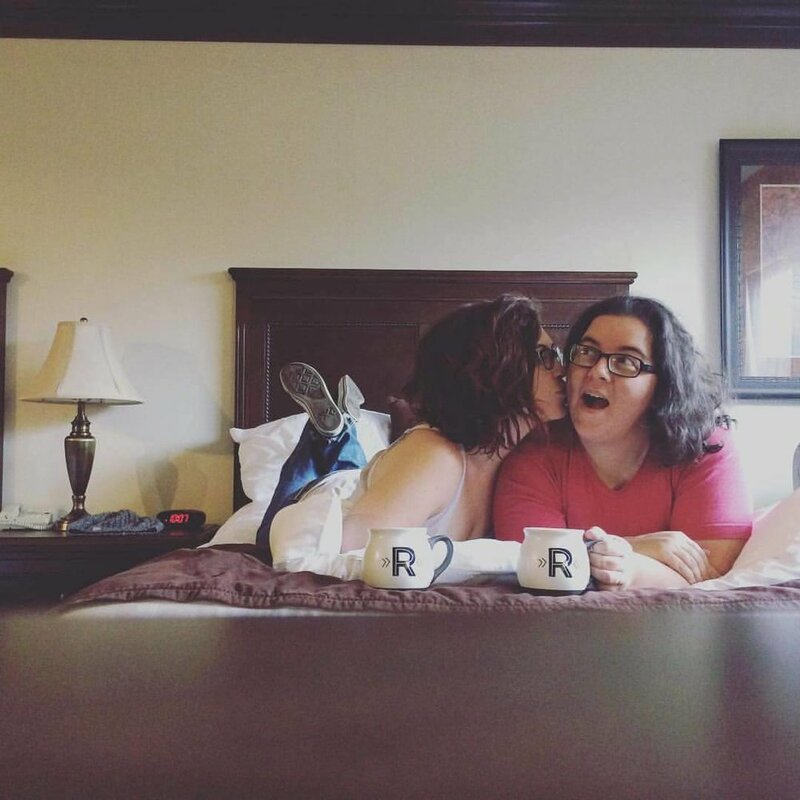 Queer Chocolatier is #outandopenforbusiness and my wife and I are out as queer ciswomen (I am bisexual and Cheri identifies as a lesbian). But we both had extremely different experiences in coming out. And everyone's experience is extremely unique to them as identities are complex and context is important. Coming out as queer is not the same as coming out as trans* is not the same as coming out gender non-conforming is not the same as a POC coming out as any one of those identities or orientations. In many cases, it is a privilege to come out that many cannot afford due to being multiply marginalized. You don't owe anyone any explanation. Your life and lived experiences are your own and yours to control. You should keep your physical, mental, emotional, and spiritual health at the forefront of any decision regarding the hows, whys, whos, whens, and wheres of coming out. If you don't feel safe, do not succumb to any sort of pressure to come out to the people or in the environments that you do not feel safe. You are not less than anyone if you do not come out in a public sort of way. You are not better than others if you do come out. You do not have to come out to everyone in your life all at once in order to have "officially come out." You may feel like you need approval by those to whom you come out, but your truth does not change in a manner that is contingent upon their approval (you are who you are regardless). However, I do want to acknowledge the importance of visibility. With visibility, there is a space or a community that provides safety. There are role models from which others may learn. There are opportunities to rally around folx with similar experiences. I am in my mid (or late...) thirties and I learn from people who are out and who are older and younger than me every day. Community inspires me like little else can. We chose to make our business visible as a way to carve out space. If you want to share your story, visit with people who may have some shared perspectives and experiences, or if you just want a quiet place and moment to let the weight of the world come off your shoulders for a spell, please know that Cheri and I are here for you. Tomorrow, please feel free to come over to our shop. Come out for yourself or come out for chocolate. Just know that we're happy to see you and be seen by you. #HeyMuncie! : Queer Chocolatier Goes to Market! 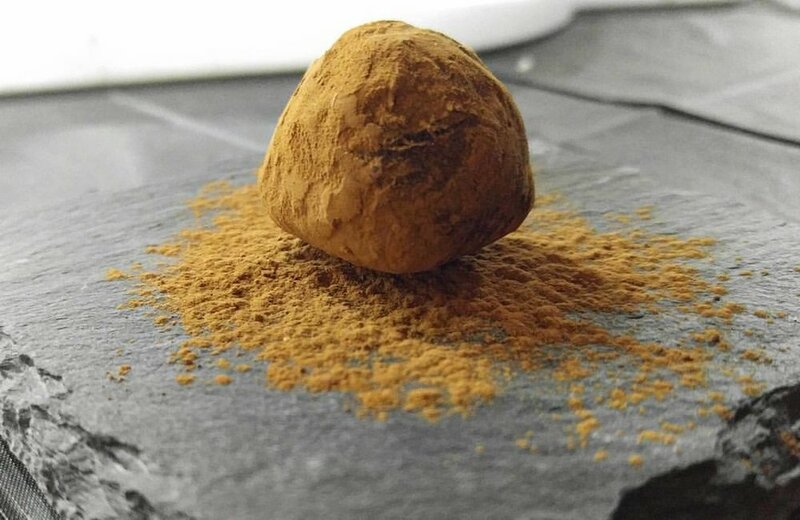 Queer Chocolatier centers on the the tangible product of quality chocolate truffles but it also rests on the foundation of an identity that claims space. In some ways, this is nerve-wracking. But it also is refreshing and rewarding! I am a queer, married ciswoman and I'm going to make you delicious chocolates. And I am equally proud of my cocoa alchemy as I am of my queer identity. However, I am acutely aware that not everyone will share my pride. We live and move in an increasingly balkanized society that pushes people to choose sides. By and large I support choosing sides. Furthermore, I believe in the idea of claiming your space first; if I am anchored and grounded in where I stand, others can use me as a landmark and decide whether to stand alongside me or not. This past weekend of vending at two local farmers' markets was my first time staking my claim in a physical space, outside of the internet, and putting myself out there as the Queer Chocolatier. And Muncie warmly welcomed me! 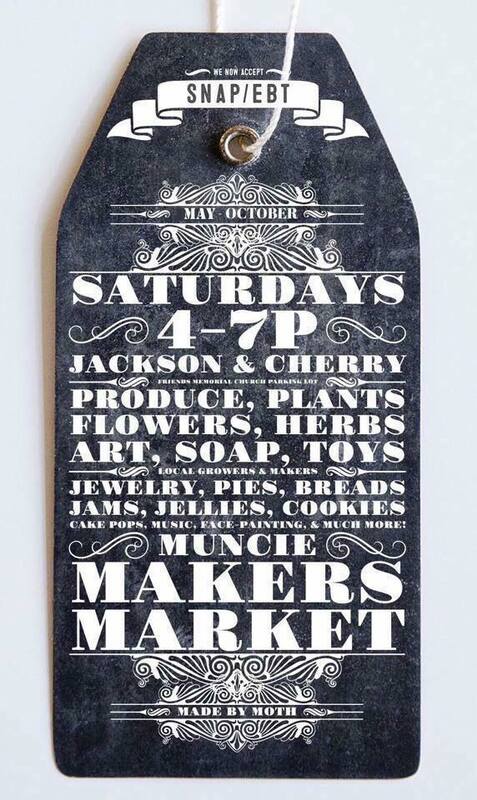 The indomitable Moth Danner runs the Muncie Makers Market and was beyond welcoming me to her roster of vendors! It was just one weekend, but I have the sense that Queer Chocolatier taking space meant something to folx. In some cases, people simply wanted good chocolate and I'm not mad! I love talking to people about my chocolate, how I make it, where I buy my source chocolate, how I've come up with some flavors (including flavors inspired by my wife). This is the price she pays for being my inspiration. In other cases, folx came to my booth to talk about identity and business and community. Some came under my canopy to say "Thank you!" or "This is such a cool concept!" It matters because queer lives matter. Trans* lives matter. Solidarity matters. Know that if you are queer, trans*, gender non-conforming, genderqueer or genderfluid, of if you fall anywhere in the spectrum of marginalized sexual and/or gender identity, I stand in solidarity with you. If you're in East Central Indiana, come visit me at Minnetrista's Farmers' Market or at the Muncie Makers' Market and indulge in truffles! And be unapologetic about taking up the space that you do!